Pune, 19th February 2016: The Honourable Prime Minister of India, Mr. Narendra Modi has set the vision and the agenda, aimed at boosting the manufacturing sector and to jump-start the contribution of manufacturing to the GDP pie. To play a significant part to ensure this agenda sees the light of the day, worldwide authority in Operational Excellence/Continuous Learning, Kaizen Institute Consulting Group (KICG) presented Indizen, The National Convention for Operational Excellence. This year, Indizen 2016 returned in its 7th edition with the theme, ‘Making Zero Defect & Zero Effect a Way of Life’. India’s best and brightest minds from manufacturing and services were part of this two day convention which took place in Pune on 16th and 17th February 2016 and saw more than 200 senior industry professionals on the same platform. The two-day event comprised of stimulating knowledge sessions, Excellence Inside tours (visits to world-class facilities/factories) and National Operational Excellence (OE) Case Study Competition. Senior officials from HDFC Life, Mahindra, Daimler, Dr. Reddy’s, ITC, Marico, Thermax, Bosch, Sandvik Asia etc participated in the event. Mr Prakash M. Telang, Chairman, Tata Hitachi Construction & former Managing Director (India Operations), Tata Motors, Mr. Tony Henshaw, Chief Sustainability Officer, Aditya Birla Group, Mr. R. Mukundan, Managing Director, Tata Chemicals were the keynote speakers. They spoke extensively on the increasing importance for manufacturing companies across the country to implement fast, flexible, and efficient processes in order to outperform themselves and be in the race, since India is now becoming a major sourcing hub. 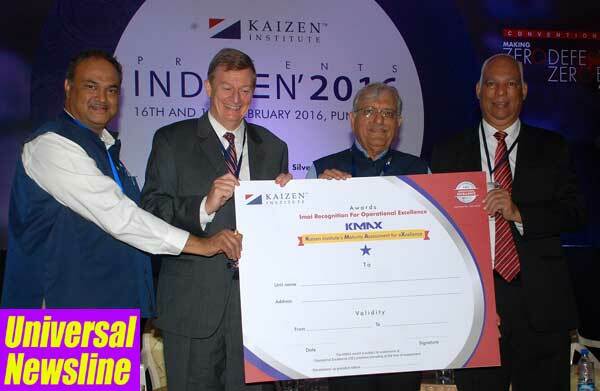 Indizen 2016, also saw the launch of a new initiative by Kaizen Institute Consulting Group (KICG) India. Titled KMAX (Kaizen Institute’s Maturity Assessment for Excellence), the initiative is a nationwide search to identify and reward Indian companies for Operational Excellence. This will involve a phase-wise process beginning with a call for entries in March 2016, proceeding to a comprehensive shortlisting and assessment, leading to an esteemed jury declaring the winners and culminating in a grand awards ceremony to felicitate the winners in 2017. Manufacturing facilities of companies across sectors and ranging from small to large sized businesses that have been practicing any Operational Excellence system for at least two years will be eligible to participate in the inaugural edition of KMAX. What sets KMAX apart from other assessment models and awards is that the actual gratification for participating companies will be the value it creates for their businesses by embarking on a quest for operational excellence; the recognition will serve as an added incentive.